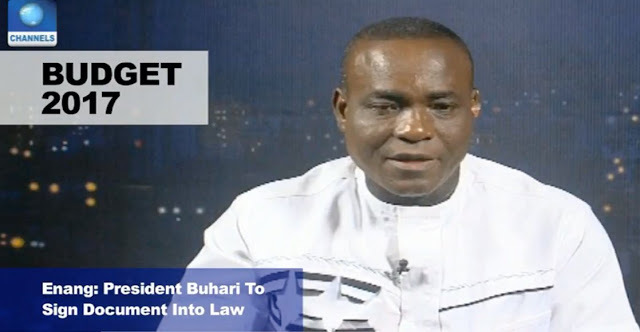 The Senior Special Assistant to the President on National Assembly Matters, Ita Enang has said that the President, Muhammadu Buhari will assent to the 2017 budget. Speaking in an interview with Channels TV, Mr. Enang explained that the President will sign the budget and then transmit it to the acting President for other formalities to take place. “The 2017 budget will be transmitted to Mr president and the President will assent to the budget. The acting President is in office and when the budget is transmitted, it will go through the processes and all those other questions will answer itself” he said. There has been controversy among ministers on who will sign the budget into law given Mr. Buhari’s absence. Recall that the Minister of Information and Culture, Alhaji Lai Mohammed, yesterday told State House reporters after the Federal Executive Council meeting chaired by Osinbajo that the decision on who to sign the budget would be taken when the document is transmitted to the Presidency.